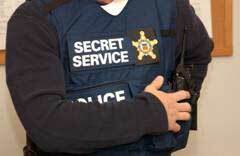 The Secret Service is investigating one of its agents after he threw a Time photographer to the ground by his neck. Still, government officials defended the Secret Service, saying agents only become involved if someone threatens the candidate. “We don’t care if people are standing and yelling at a candidate, or saying they want peace in the Middle East, but if they say they’re going to kill the candidate, then it’s going to get pretty bad,’’ said one official familiar with Secret Service procedures, who spoke on condition of anonymity because the events at Monday’s rally remain under investigation. Trump has had Secret Service protection since early November, a common services for presidential candidates.